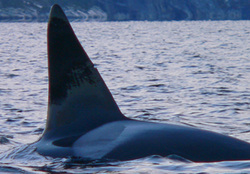 P118, a member of Morgan's extended family, was located in June, 2012. Learn more about Morgan's extended family. You will be redirected to our Free Morgan donation page on IM2TO our donation platform. You can get updates from us when you log on through our platform. Click here to learn more ways you can help Morgan. Dr Ingrid Visser presented startling new findings from her October visit to Loro Parque. Following on the heels of the data and images submitted to the Amsterdam Court, from her June visit, Dr Visser returned to check on Morgan’s welfare. Unfortunately, Visser has found that the intervening 19 weeks have showed not only an escalation in aggression from the other orca, but Morgan has begun to exhibit a stereotypical behaviour which has not been documented before. In this case, Morgan repeatedly bashes her head against the side of a gate closing mechanism. Additionally, Morgan’s boredom and stress have manifested themselves in an acceleration of tooth wear, with a third of some teeth now permanently damaged and the tops worn off. Blue paint on the teeth clearly shows that Morgan is biting concrete below the water surface. Trainers have been photographed ignoring Morgan whilst she vies for their attention. Morgan's latest court hearing took place on Thursday 1st November in the Amsterdam District Courts. Free Morgan Foundation expert board members Dr. Ingrid Visser, Jeff Foster, Jean-Michel Cousteau and Lara Pozzato, along with members of the general public from all over the world, attended the hearing to present evidence to the three presiding Judges and to show their support for Morgan's freedom. You can read a brief summary of the court hearing, the full detailed summary of the court hearing, as well as an account of the court hearing in our Latest News. HSH Prince Albert II of Monaco has released a statement that he has been involved with rehabilitation and release of captive animals. He also believes that Morgan should also be given her chance to return to the wild. His full statement can be read on our Latest News. Jean-Michel Cousteau will be in Amsterdam to attend Morgan's court case. Interested Media can schedule interviews. On Thursday November 1st a court committee will once more decide on the fate of Morgan the orca, currently kept at Loro Parque, Tenerife, Spain. To support Morgan’s case, Jean Michel Cousteau, first son of ocean explorer Jacques Cousteau will be attending the court hearing. Morgan, found in the Wadden Sea in a severely weakened state in 2010, has been living in a Spanish amusement park in Tenerife since November 2011 after a judge decided it was in the best interest of the orca be placed with other orcas. Since her transport to Loro Parque, the orca’s condition has rapidly deteriorated. The merit procedure will analyze the lawfulness of this ruling. “Orca’s are the most intelligent and sophisticated creatures in the marine environment. We will do our best to convince the judges to release Morgan back in the ocean” said Jean Michel Cousteau, explorer, environmentalist, educator, film producer and founder of the Ocean Futures Society and member of the Free Morgan Foundation expert board. The Free Morgan Foundation provides the Orca coalition with expertise in the court hearings and has a detailed release plan ready for Morgan. The story of Morgan the orca has captured the world with a sense of dismay and injustice. Despite a viable release plan put forward by over 30 experts, a Judge in the Netherlands ruled that Morgan should go to Loro Parque, a theme park in Tenerife. In June 2010 a lone female orca calf was captured from the Wadden Sea, off the northwest coast of the Netherlands, under a rehabilitation and release permit. She was emaciated and dehydrated. The Dolfinarium Harderwijk took this orca, whom they named Morgan, to their facilities in order to administer medical health care. They weren’t allowed to display her to the public and she was to be prepared for reintroduction back into her natural habitat. Unfortunately, this isn’t what happened. Morgan currently languishes in Loro Parque, a privately owned entertainment park in the Canary Islands. She is used in shows and is abused by the other orca at the park. Yet, there is strong evidence that illustrates that Morgan is a suitable candidate for release back into the wild. Since Morgan’s capture two years ago, the Free Morgan Foundation has been fighting for Morgan’s freedom. Please help us in our efforts. Free Morgan Foundation - Morgans story from Fair Projects on Vimeo.